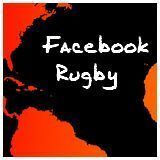 A rugby kick-off takes place when you start or restart a rugby game - know where you kick the ball and why - it`s important! You start each half of the game with a drop kick. You also restart in the same manner after each score. All players must be behind the ball when it`s kicked - so always stay behind the kicker! If you`re the kicker, be sure all players are behind you before you kick. If the ball is blown back it still counts. The opposition may choose to play the ball even if it hasn't travelled the required distance. When the ball has been 'made dead' in the ingoal area the game is restarted with a drop kick on the 22 metre line. It`s called a 'drop out' and can be taken anywhere along the 22 metre line or behind it and all players must be behind the kicker. For a '22 drop out' the drop kick simply has to cross the line before it can be caught or picked up. Long kick-off. Kick deep into the opposition half - good gain in ground but little chance of getting possession when the ball lands. Opposition can kick the ball back or run it back before you get there. Your initial gain in ground may be reduced. You may even find the ball back, deep in your own half. Keep the other side guessing - vary your kick - but make sure your players know where it`s going! The attacking team knows where the ball is going. The defending team has to guess but is guided by the positioning of the attacking players. When it`s your kick-off you will tend to kick so as to put the ball in front of the bulk of your forwards. This will improve your chances of regaining possession and reduce the risk of defenders breaking through when carrying the ball back, out towards you. You also aim to cover right accross the field with your backs. This allows for the odd surprise attack and ensures the opposition have no easy route out of their territory when returning the kick. All players must be behind the kicker when the kick is made. Then you charge up the field, maintaininng your position relative to your team mates so as to provide a solid defensive pattern. At the same time you must ensure that you advance at a rate and in a pattern that allows you to guard your own territory from advancing punting or chip kicking opposition players. 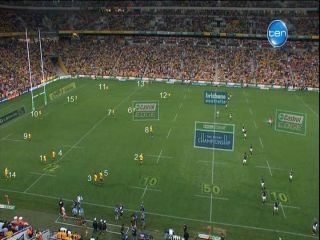 Actual player positioning on the ground for a rugby kick-off is normally similar to the pattern of the scrum/backs positioning at scrum time. The attacking team locks will tend to lead the charge for the ball because they are tallest and have the best chance of regaining possession. A popular ploy is to sent your faster runners after the kick. They leap for the ball and tap it backwards to following support players. The tap-back can be made at a greater height than an actual catch. The defending team will tend to mirror the attacking team positioning. At higher levels defenders may be positiond slightly differently so that locks can be lifted to receive the kick. This gives a clear indication of how team members are allocated positions at the kick-off, offering defence over the whole field. Players tend to be positioned at the farther limits of their area as it is always easier to move towards the ball and catch it. At this high level of rugby several potential pods of players have been positioned, each with a tall jumper and a stockier lifter/supporter. They are 3(prop) and 5(lock) for the shorter kick-off. For the longer kick, 1(prop) and 4(lock). 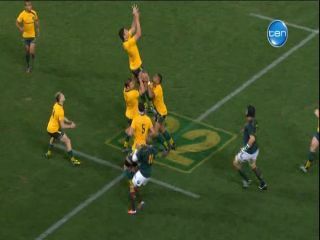 For a kick down the centre, flankers 6 and 7. When the ball has been kicked and the landing spot can be predicted, players adjust their positions and roles. In the above image it has become clear the ball is going to the players on the 22m line so players in front are moving to support and assist. Players at the centre and far side of the field adjust their positions so as to be behind the ball and able to assist in moving the ball. They will also be 'on-side' and able to chase if a clearing kick is made. In the above image the player going to catch the ball is now also assisted by the lifter no longer needed in the 3,5 player pairing. Other players continue to fall back in support. 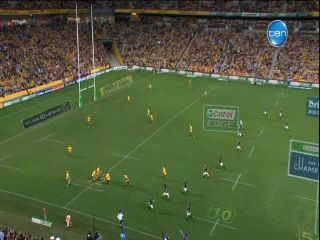 Frame grabs from Channel 10 coverage of Australia v Republic of South Africa, a Rugby Championship match on September 7th, 2013.